Last year we attempted to have out 7th graders write an epilogue about a chosen character from the novel. The results were far from stellar. We did not realize the difficulty of this task for students who struggled with creativity, making inferences, and writing in general. 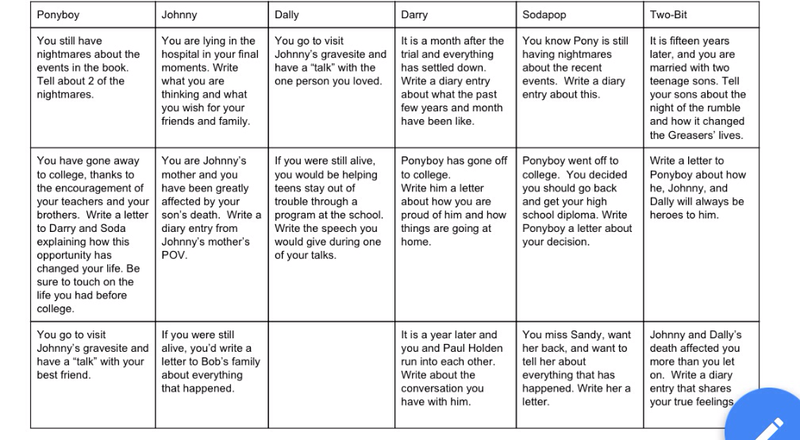 This year we approached it from a different angle, assigning each student one character and then giving them three choices for their epilogue. These activities ranged from letters to diary entries to speeches to conversations between old friends and new family members. Below is a screen shot of what they received today. I’m looking forward to the next step which their language arts teacher has laid out a nice plan for with very specific tasks and skills. It includes checkpoints along the way to ensure success. I’ll share the PDF of the choices I created. It’s very much like a RAFT writing assignment. Hopefully this year’s epilogues are better than last year’s! I’m curious if one of your students chose the first one for Two-Bit and then pulled a Harry Potter where his kids were named after Johnny and Dally.